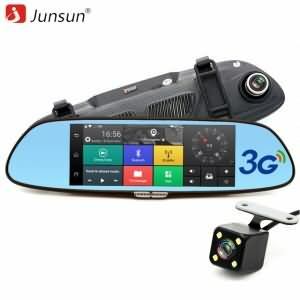 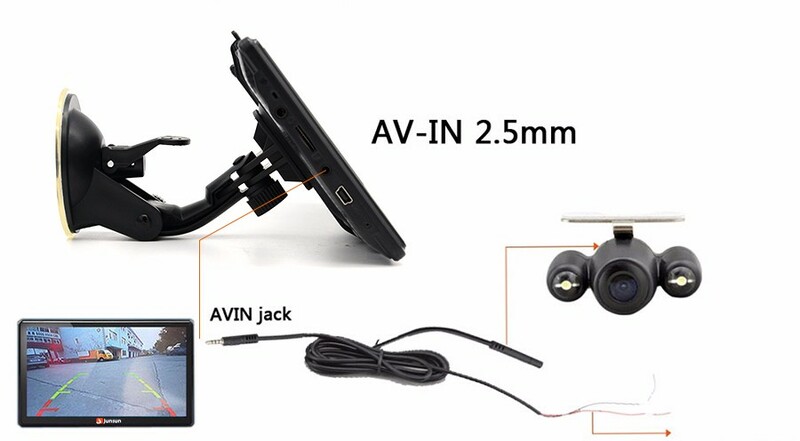 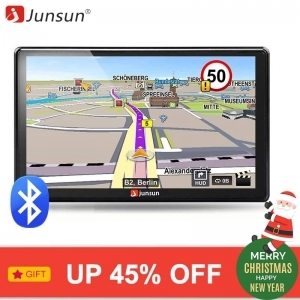 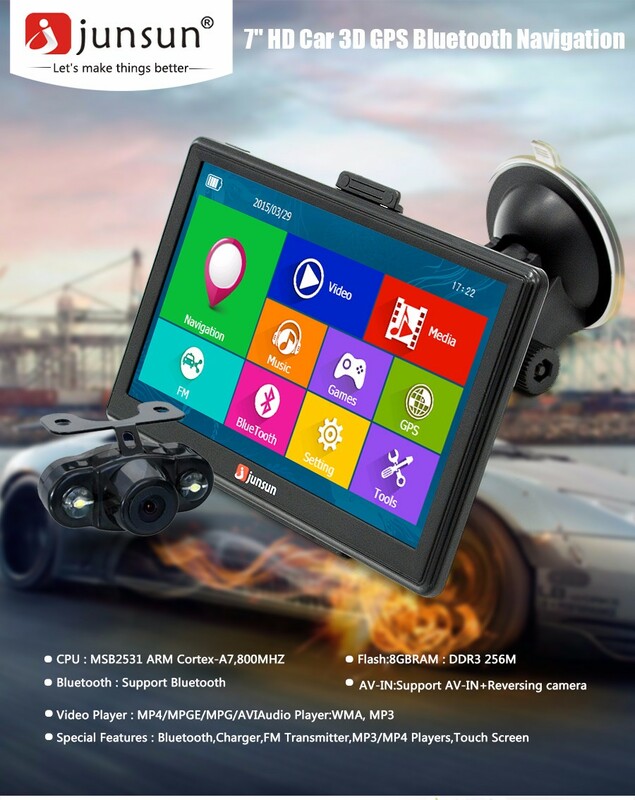 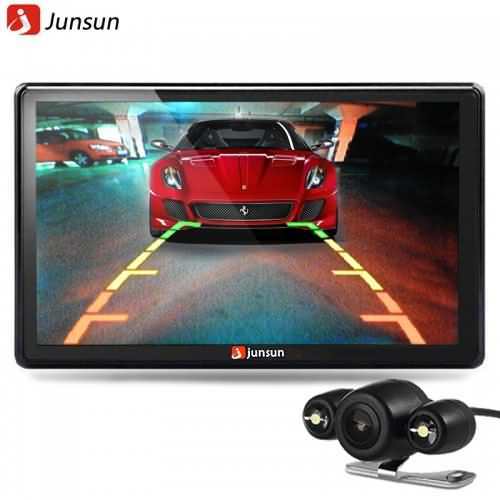 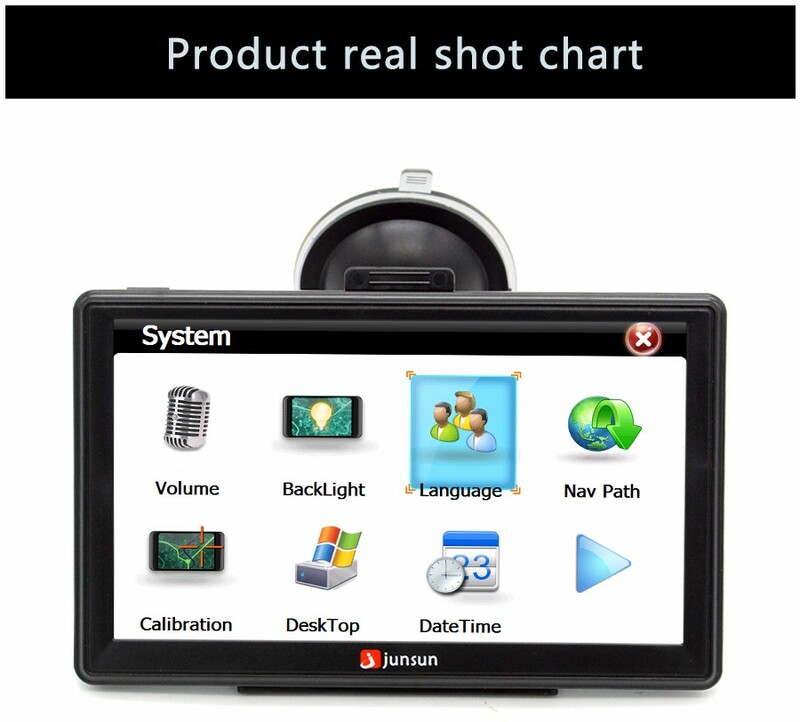 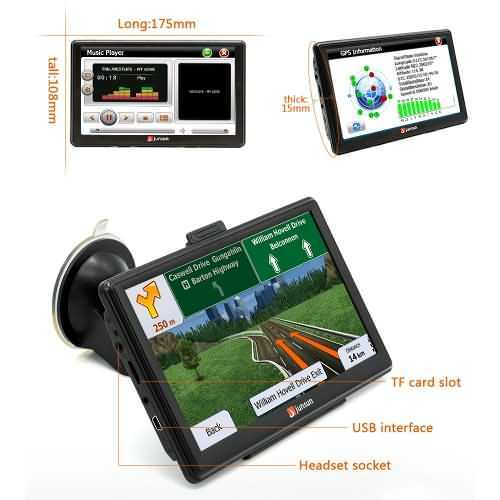 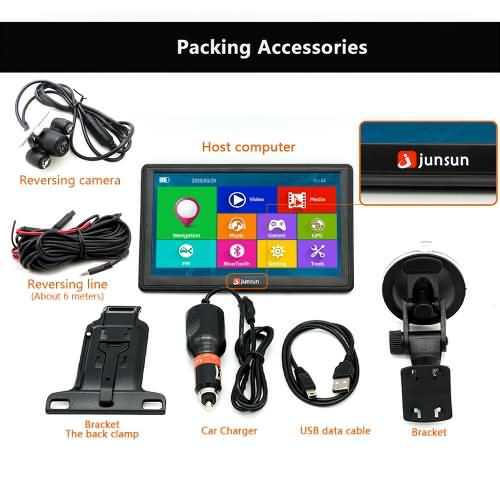 Junsun 7 inch Car GPS Navigation 8GB with Rear view Camera FM MP3 MP4 256MB DDR/800MHZ Bluetooth Dedicated, Easy-to-use GPS Guidance, possible detours that may help save time. 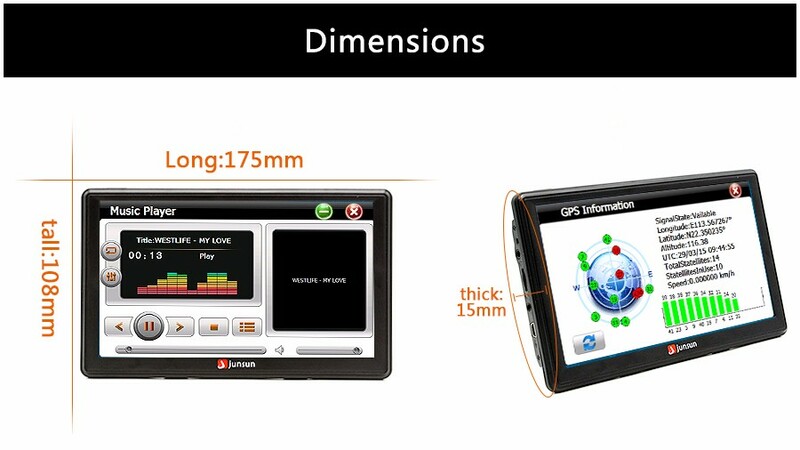 The Good Material of the GPS and The Workmanship, The Good Maps ;Faster GPS Signal Info . 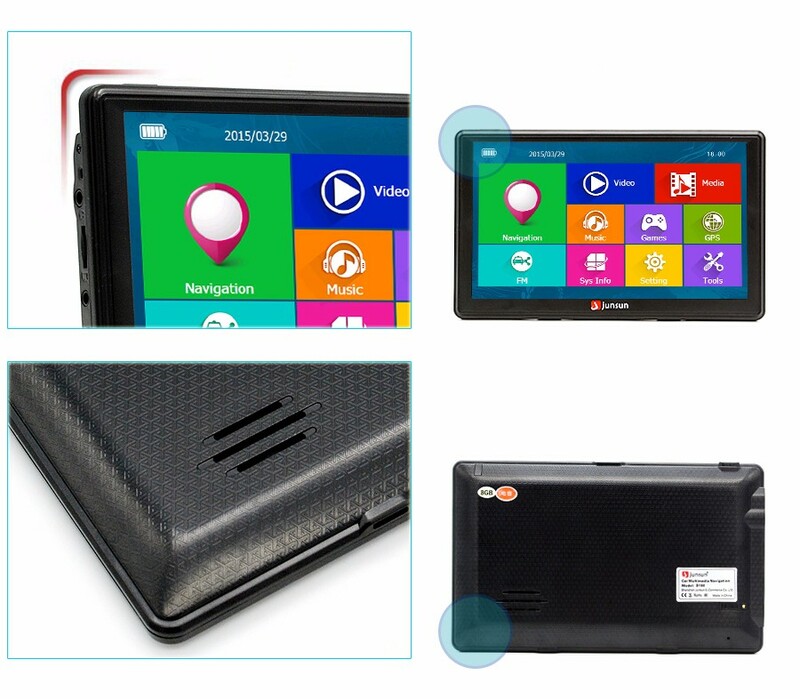 7-inch capacitive screen, touch more sensitive. 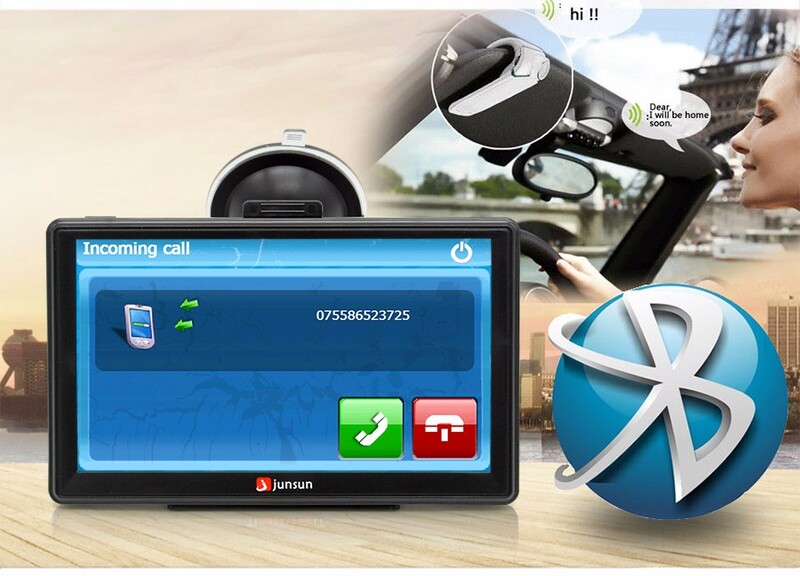 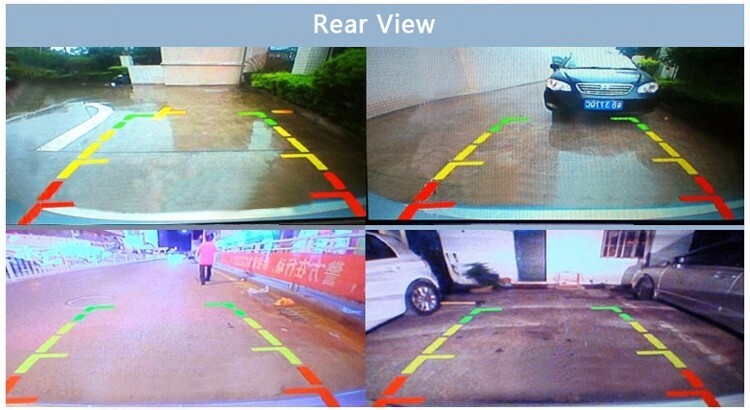 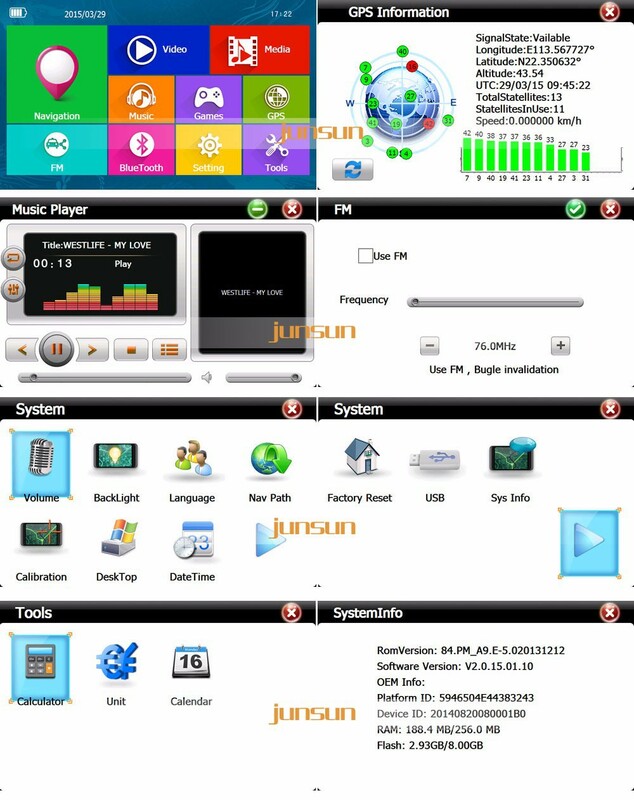 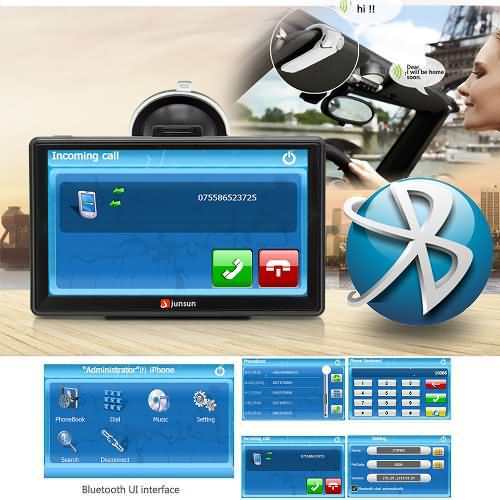 FM emission function, the navigation voice and music will be directly sent to the car speaker. 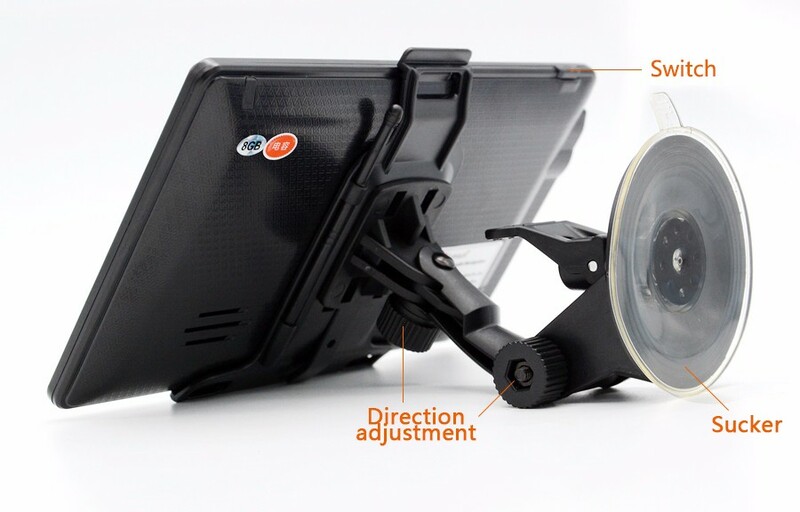 With this function, the sound become better and louder. 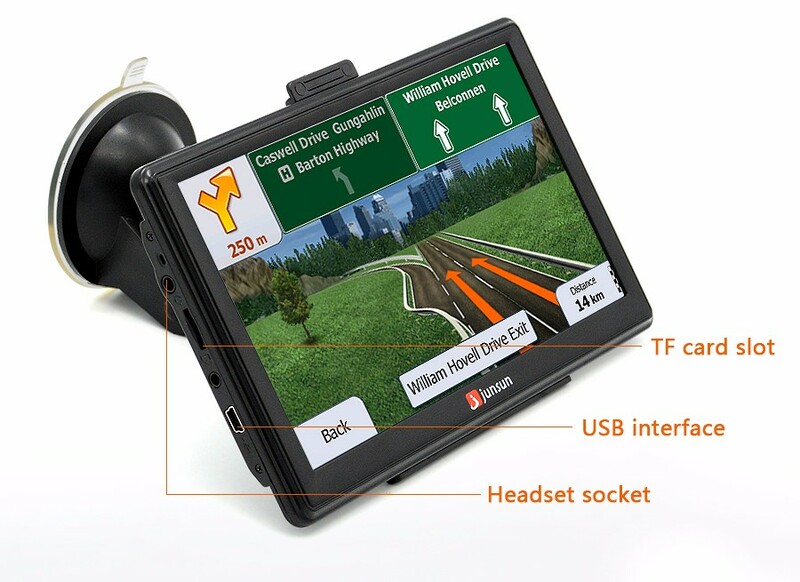 3D navigation, no need to worry about the complex viaduct and the maze crossing. 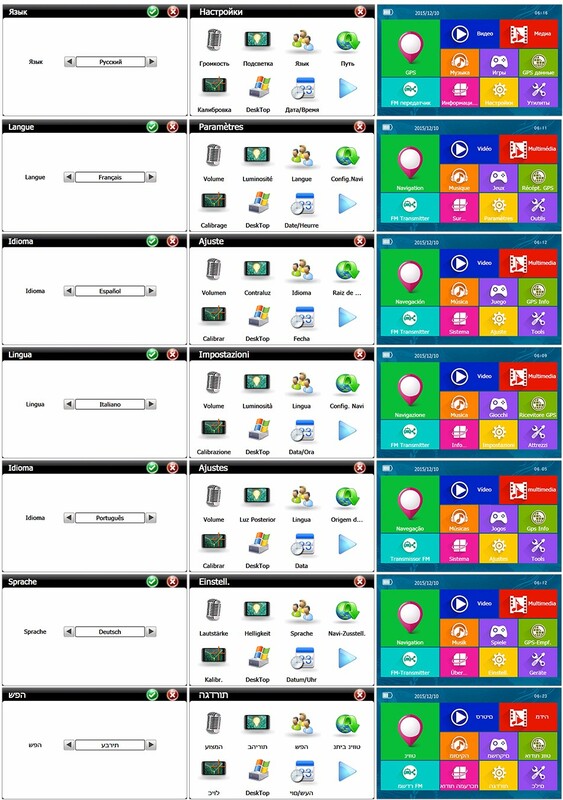 Menu Language : Russian, French, Spanish, Italian, Portuguese, German, Hebrew, Dutch, Swedish, Turkish, Polish, Finnish, Lithuanian, Norwegian, Serbian, Bulgarian, Hungarian,Estonian, Indonesian, Azerbaijani, Ukrainian, Slovak, Slovenian. 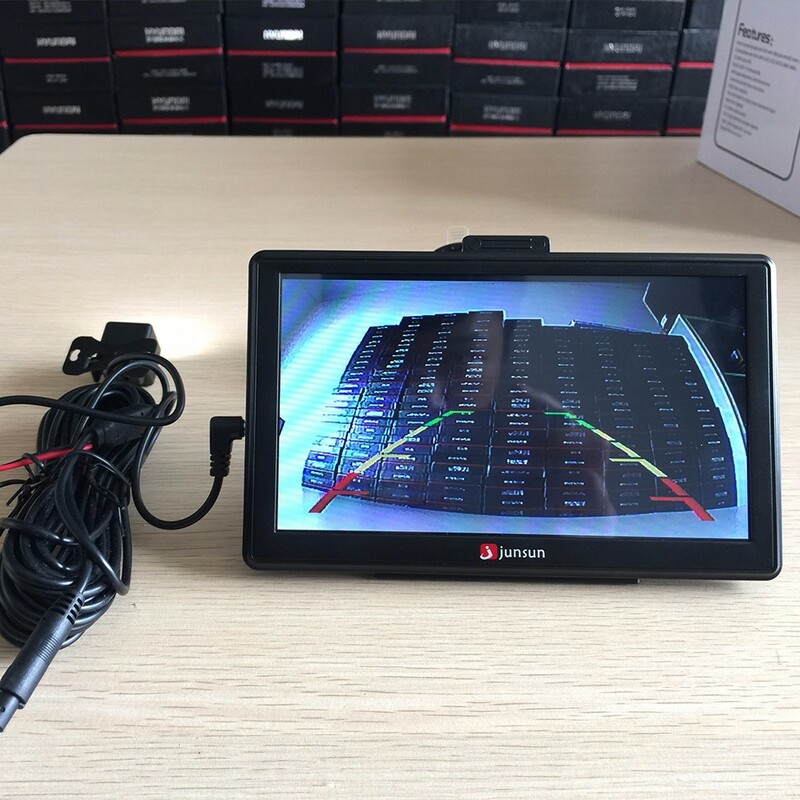 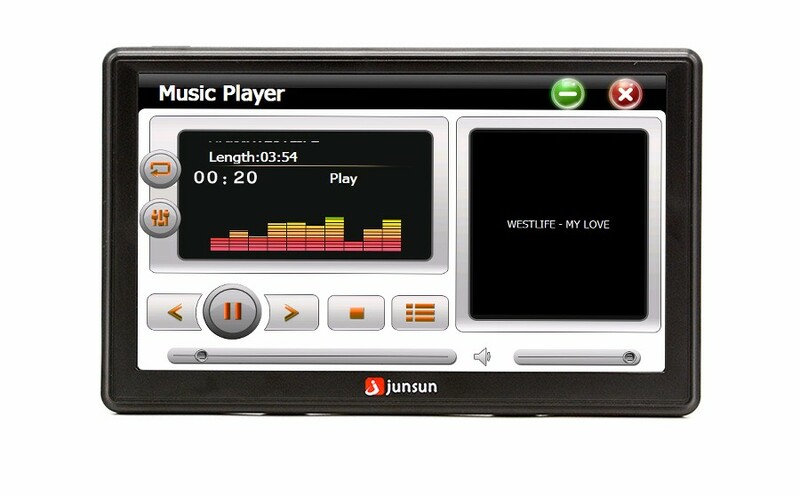 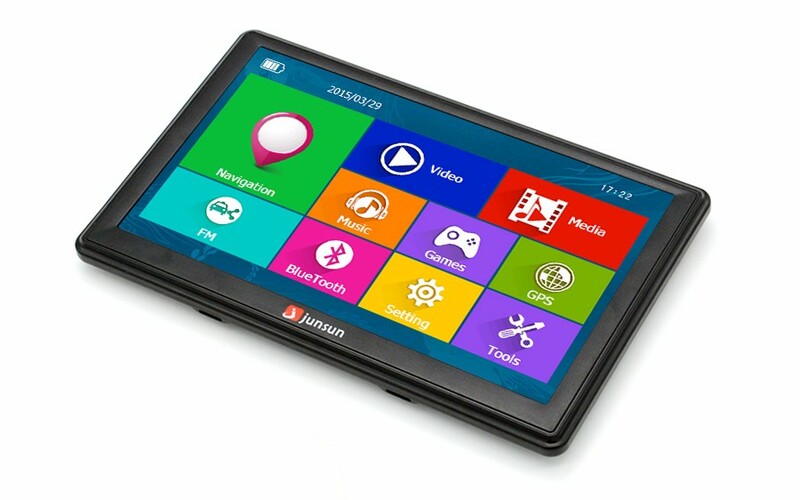 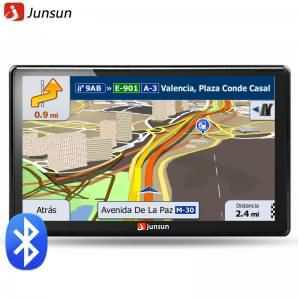 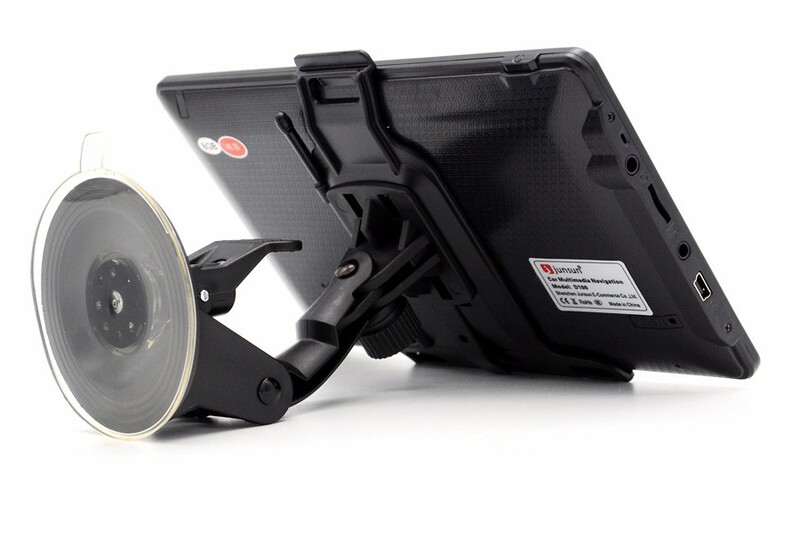 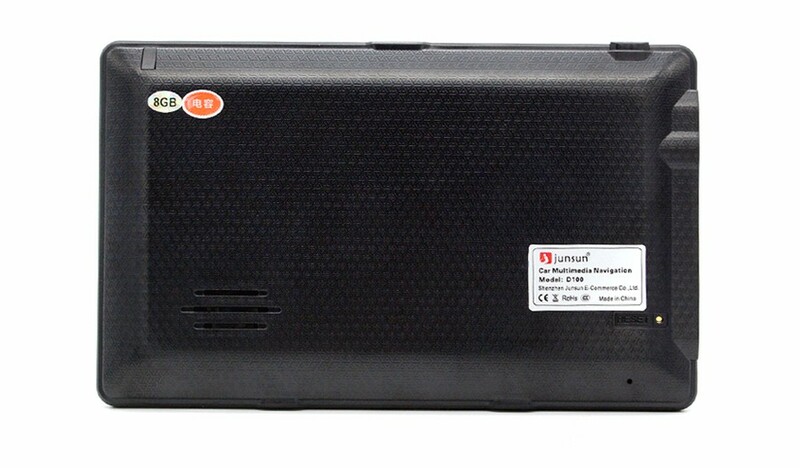 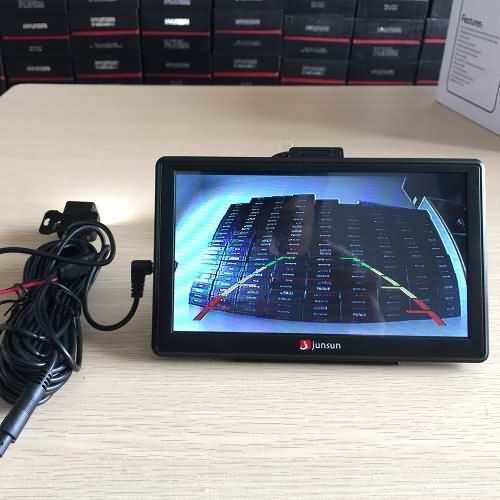 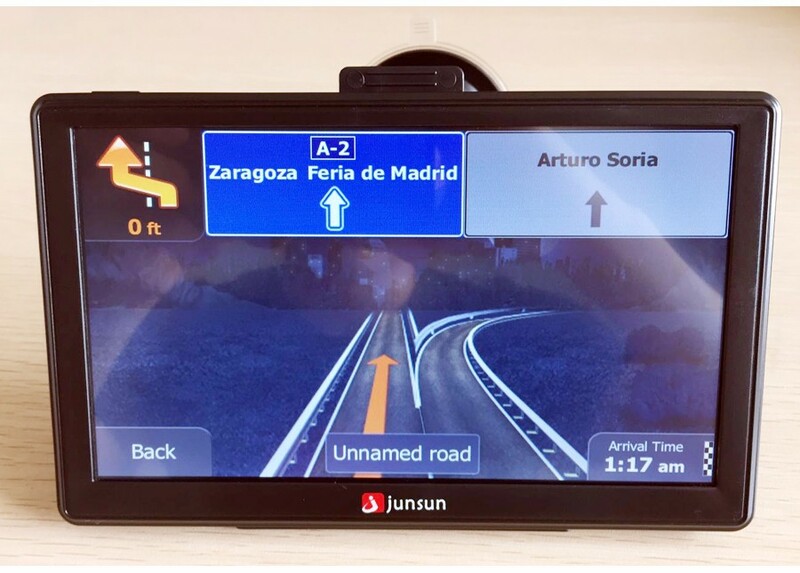 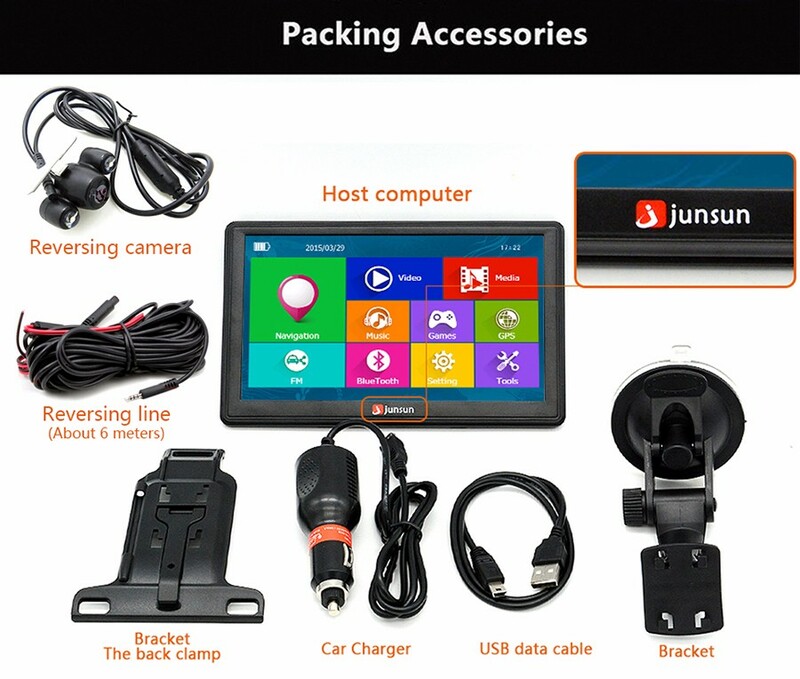 The Junsun device arrives with a bright 7.0″ display with detailed maps. 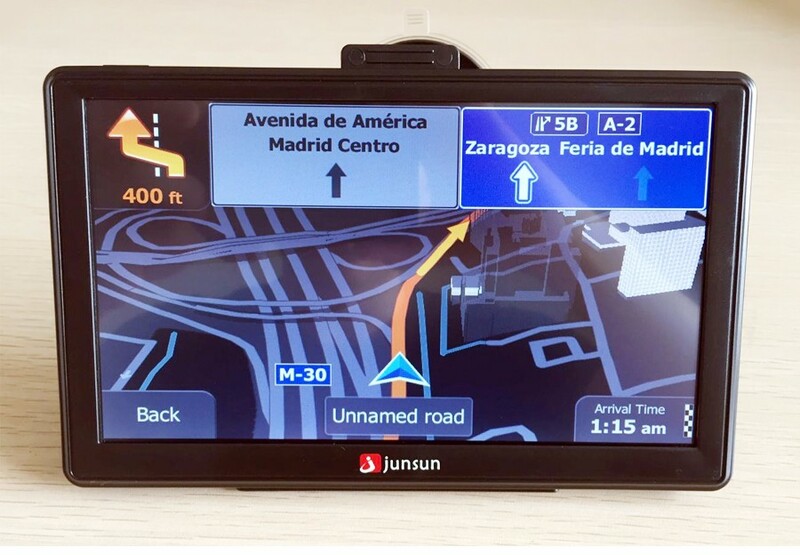 With free lifetime map updates, your routes are sure to reflect the most up-to-date maps, POIs (points of interest) and navigation information. 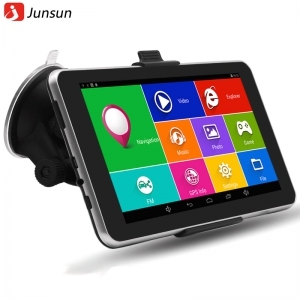 Junsun GPS Navigation has a search field that makes it easy to find addresses. 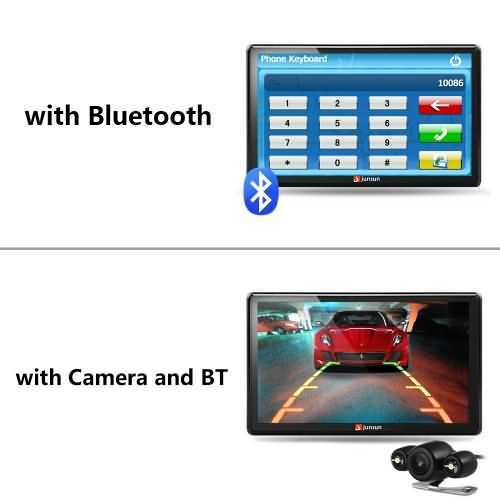 Speed limit indicator – unit displays speed limits for most major roads. 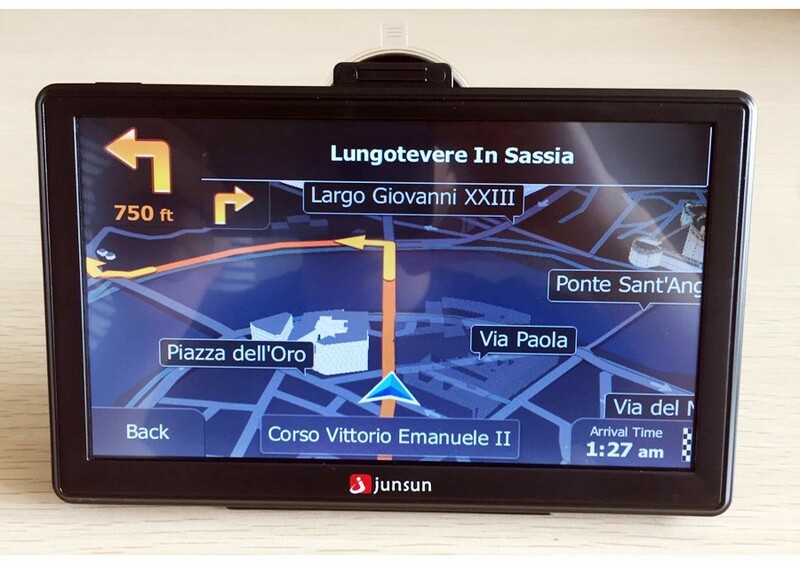 The device arrives with a bright 7.0″ display with detailed maps. 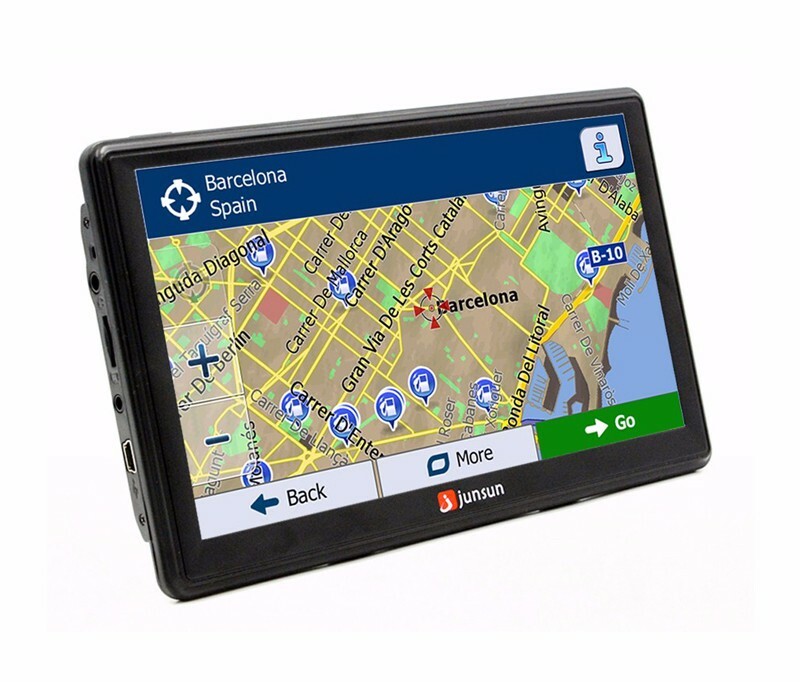 With free lifetime map updates, your routes are sure to reflect the most up-to-date maps, POIs (points of interest) and navigation information. 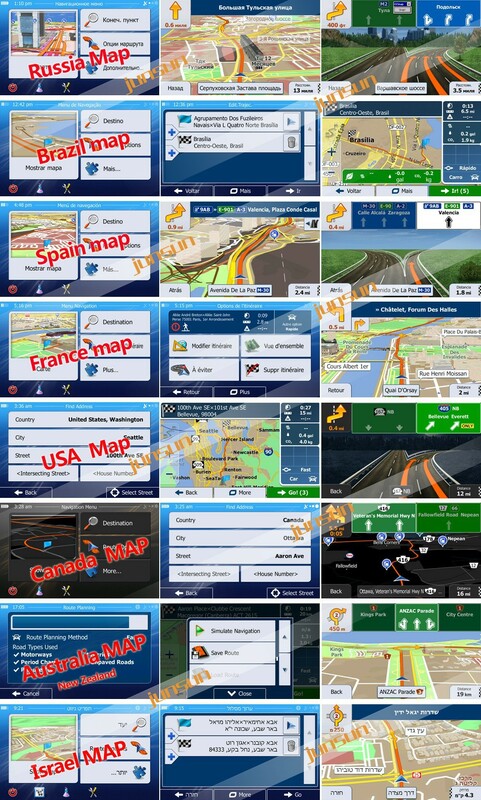 English (AU), English (UK), English (United States), Russian, Spanish, Italian, Portuguese, German, French, Arabic, Canada, the Netherlands, Poland, Sweden, Finland, Hungary, Lithuania, Norway, Turkey, Romania, Estonia, Latvia, Denmark, Indonesia, Croatian, Catalan, Slovakia, Bosnia and Herzegovina, Slovenia. 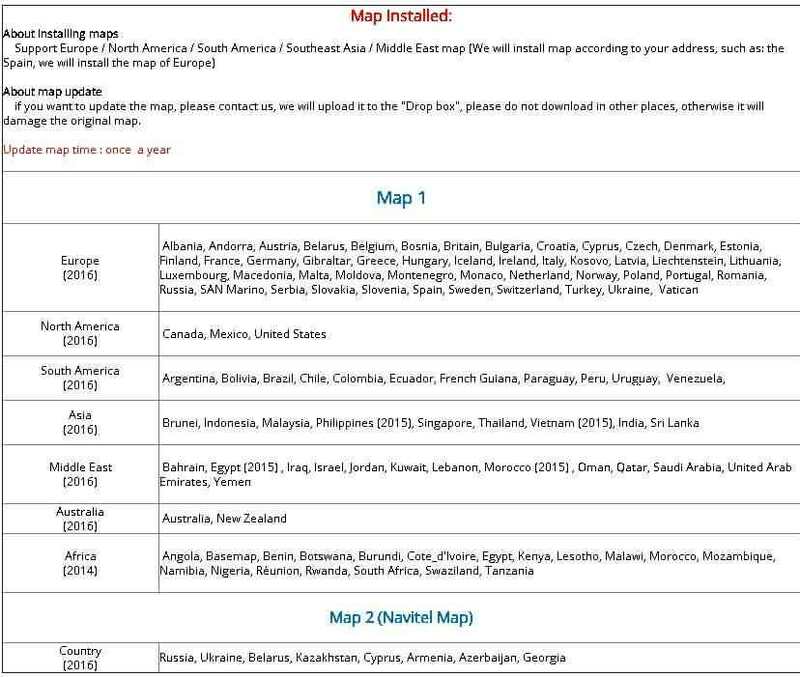 Note: that some of the map languages may not be 100% translation. 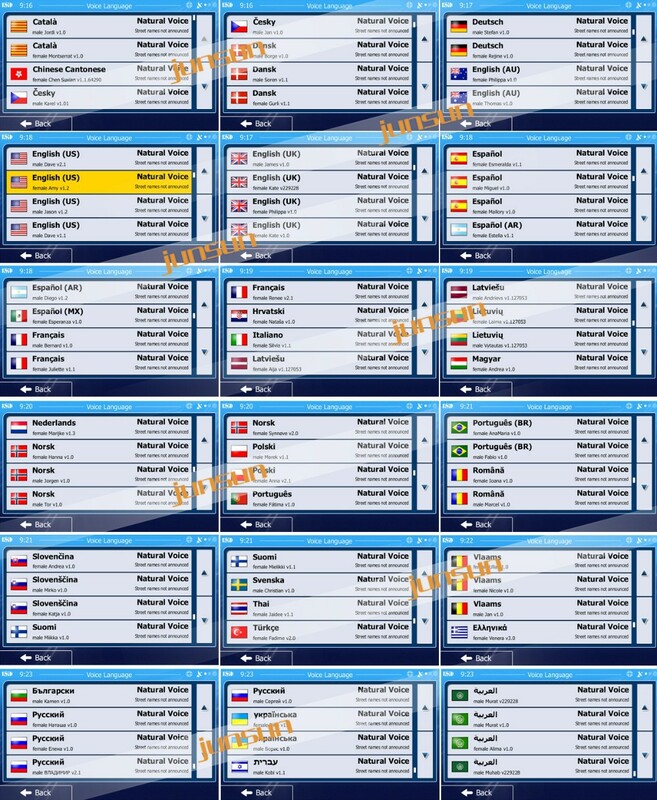 Catalan, Russian, Slovak, Danish, German, English / UK / USA, Spain, French, Croatian, Italian, Latvian, Hungarian, Dutch, Norwegian, Polish , Portuguese, Romanian, Slovenian, Finnish, Thai, Turkish, Hebrew.